I have a function setConfig(options) where I set variables like the Wifi SSID, password, device name, etc, and I'd like to be able to save these variables to the flash memory on the fly. This function has a save() function at the end which calls onInit() again. I noticed that the previous Wifi connection reconnects on top of the new Wifi connection. I tried explicitly disconnecting it and setting the wifi variable to null, but it still does the same thing. Is there anything I can do to remove the previous instance? Or is this normal and I shouldn't be worried about it? 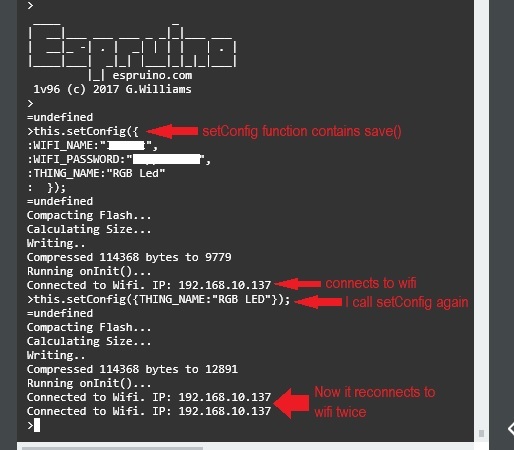 Could it be that in setConfig you're actually forcing a connect again, then saving? In that case, it'd be saving the current state (which is in the middle of a connection), but then onInit is firing off a second connection? So now when you change your wifi details it modifies just the wifi details in a file called wifi, but leaves everything else the same (and doesn't require a reboot). Hi Gordon! Thanks for the reply. My bad for not noticing the Storage module. This works and it makes it much easier than calling save() every time. Thank you!